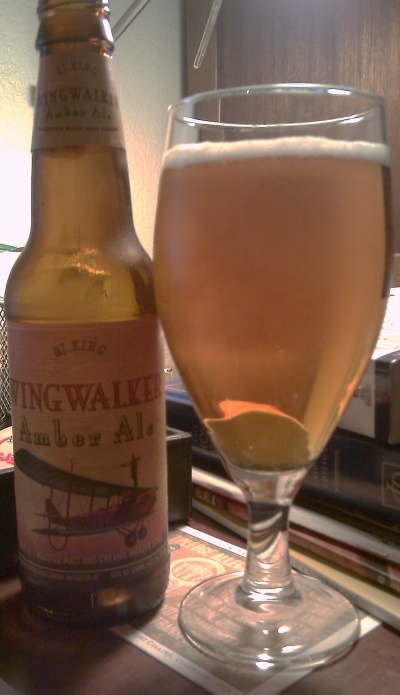 A nice amber ale from New York, brewed by RJ King. I picked this up in California, it isn't sold in Flagstaff that I know. It has a good color and a thin head. A little sweet, the malt predominates with very little hop flavor. A little sour on the finish, but nice and creamy. The body is a little thin. Fat Tire is the amber I judge all other ambers by. Is this beer as good as Fat Tire? No. Is it a good beer? Yes. I wouldn't mind this beer at all. However, I would pick Fat Tire everytime if given the choice.